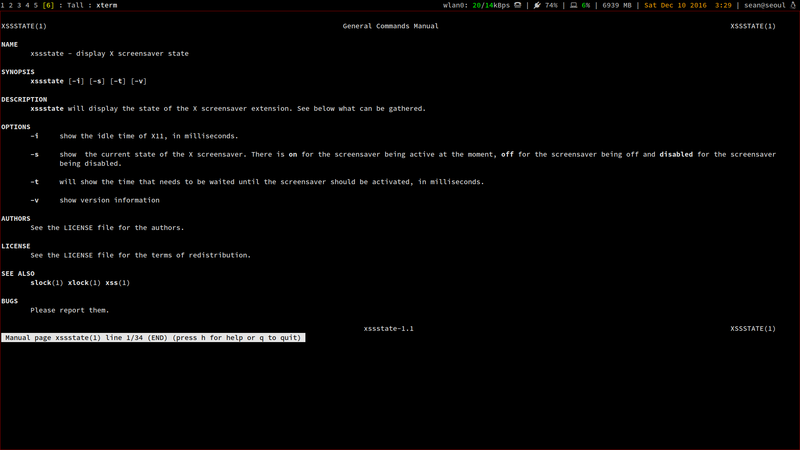 Today's utility is xssstate, which lets your check the status of X window system's screensaver. It's written by the suckless guys, who've created a number of very good tools, such as surf (a minimalist web browser) and dmenu (autocompleting program launcher), both of which I use regularly. Obviously the screensaver is off, since I am actively using this computer - however if the screensaver was active it'd print "on" and if it was disabled altogether you'd see "disabled". 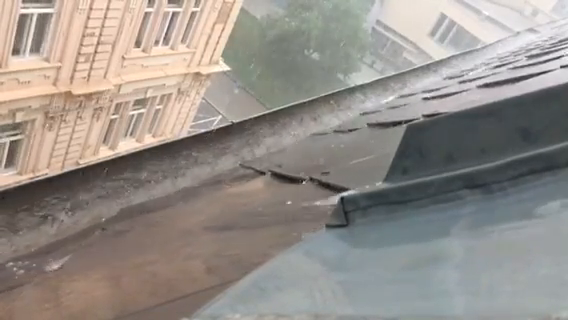 This ends up showing with something like the below - apologies for shaky-cam! So what does all this mean and why do we need it? During the execution of some program we may have requested and released lots of differently sized objects from the heap. This could result in a pretty fragmented heap. This could mean that allocating new buffers is either a little slow or unpredictable, since we need to search for an appropriately sized buffer before we can mark it as allocated and return it to the calling code. If any part of our application depends on a particular object being allocated quickly and predictably this is not ideal. Slab allocation involves setting up a slab which can hold certain amount of objects of the same size and type. Since we're dealing with fixed-size objects allocating space for a new object is quick - we just need to scan through an array to find an unused slot, mark it as used, then calculate the address (start_addr + size * index) and return it. We could roll our own implementation since it's pretty straightforward to implement - and that would be quite an interesting project for an evening or so. However if we're writing Linux kernel or module code there's already an existing set of functions which are well understood and battle-hardened. In addition these functions hide a lot of underlying complexity by abstracting a lot of the memory management (we can actually have numerous slabs, but Linux manages this for us). Inside our modules init_module we can use kmem_cache_create - so that our slab cache will be called "slabdemo", it'll allocate objects with the required size. Since I don't really care much about performance (specifying an appropriate alignment could permit us to use different/faster load instructions) so we'll just request it to be single byte-aligned. So there it is - our slabdemo cache is there, with 128 objects allocated in a single slab which can fit 240 objects in total (peculiar number!). 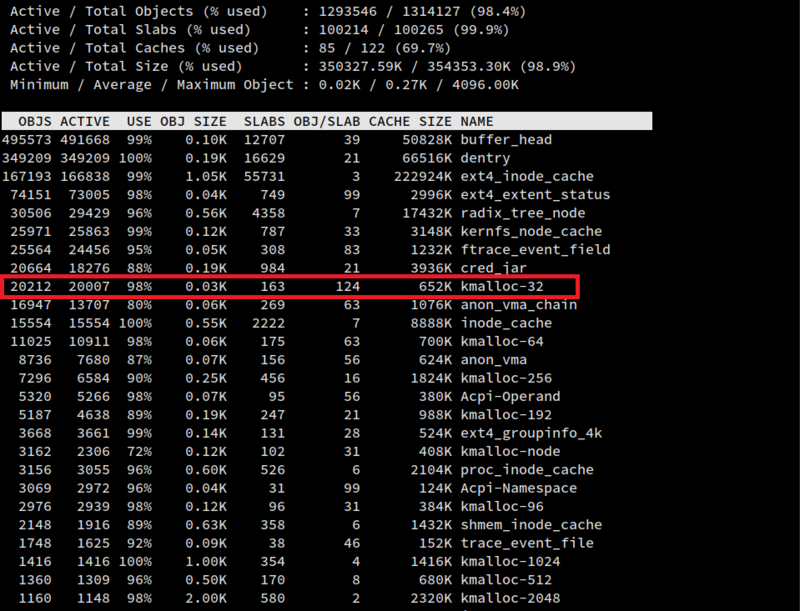 If you check out slabtop you can easily see things like kmalloc-512, kmalloc-1024 and kmalloc-2048 which are probably slab caches used by kmalloc for allocating memory pools of 512, 1024 and 2048 bytes respectively. In any case, that's another issue for another day. Obviously this is a tool designed for kernel developers, or for sysadmins of particularly performance-critical sysadmins, but I'm glad I took the time to potter around with it. After my original effort to get Debian to play nice on the X250 there were still a handful of things which weren't right. This mostly covers the remainder of the things that I had trouble with. For more info on the Synaptics touchpad driver, as always ArchLinux has some excellent documentation on the subject. 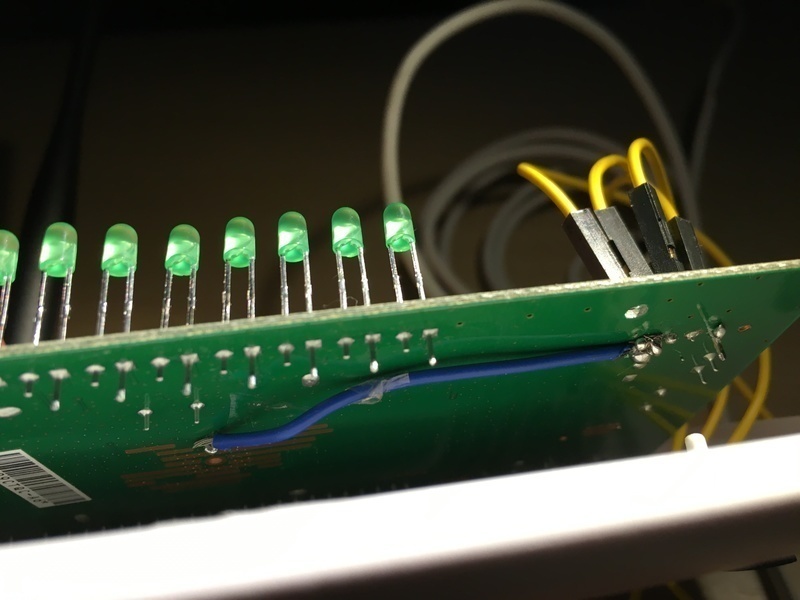 This post describes setup and example usages of Smartcard with a Thinkpad's onboard reader and OpenPGP to handle keys for authentication and encryption. Your master key will be stored (securely I hope) on a USB drive and rarely used, with your Smart Card containing a couple of subkeys which will be used to sign and authenticate day-to-day. There are already very technical guides on how to set this up like the one on jclement.ca which steps 1-5 heavily lean on but even if you're pretty tech-savvy you may end up not 100% understanding exactly what you've actually done. 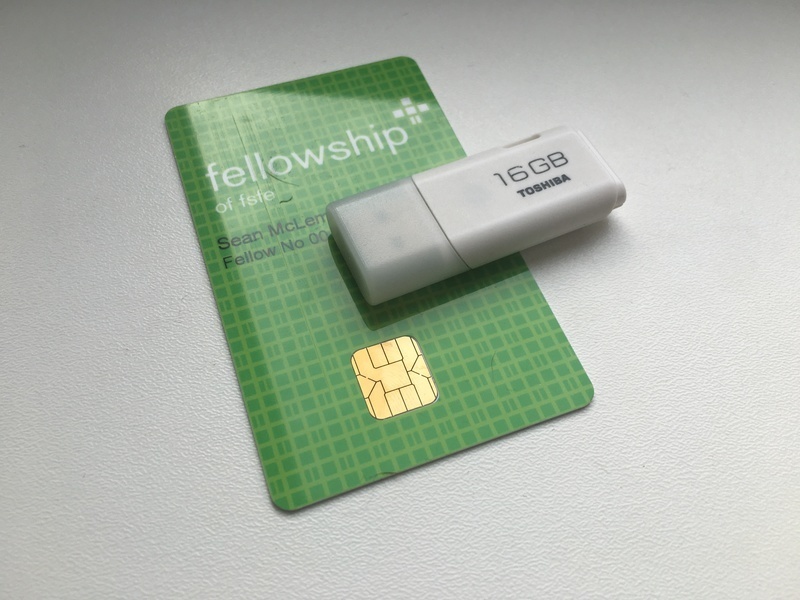 I got my Smart Card by becoming a member of the EFSF fellowship or by picking up another OpenPGP smartcard (or a YubiKey if you don't have a reader, here). Yes I used a very slow USB flash drive and it was rather painful. $ cat > ~/.gnupg/gpg.conf << ! At this point jclement.ca advise that you disconnect from the network - which is probably a good idea since we're about to generate a handful of keys and we don't want anything to leak. What we're going to do is create a Master Key - which will be stored on a USB drive - and then use it to create a handful of Sub Keys which will be stored on the Smart Card for day-to-day use. Since the Sub Keys could conceivably be compromised we'll generate a revocation certificate which we can use to notify everyone that they should no longer be trusted - at this point we'd generate a new set of Sub Keys and load them onto our card. Since there are a number of utilities and technologies you may not be familiar with I'm going to show a diagram at the end of each step in the key-creation process to help visualise what exactly is going on where. Here's a little diagram showing what symbols I'll be using. So now we've got a Master Key our live distro's temporary filesystem. As I mentioned before this should only ever live on a USB key - to do anything useful we'll need to generate some Sub Keys. 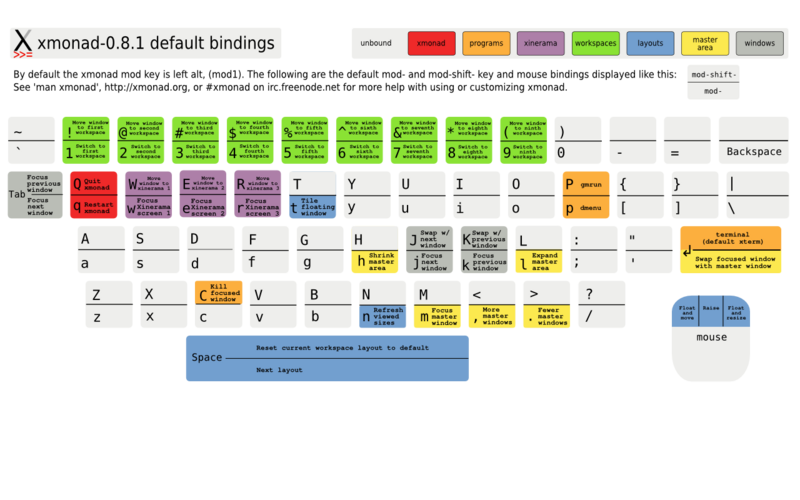 A bit of a better explanation of Sub Keys is at https://wiki.debian.org/Subkeys. Remember, these are the keys we'll be using day-to-day and will be stored on our Smart Card. Now we've got the newly created Master and Sub-keys on the local filesystem. The certificate itself is pretty sizeable, so the resulting QR code is pretty dense and you'll need a reasonable camera to successfully scan it (my iPhone 6S worked nicely). Using the lines above the resulting image will look a little like this - it's a little huge so I didn't want to include it in-line. Note - it is important to do this. Once we restart the filesystem of the live CD will no longer exist, and we'll lose all of our keys. then load the subkeys to the card. Now we can reboot, upload our public key to the internet and here's what we have - a master key stored offline/disconnected, a set of sub-keys on the smartcard we can use for everyday tasks, a printed certificate we can use to revoke our subkeys, and a public key somewhere on the net we can share with anyone we need to communicate securely with. When you're sufficiently certain you've got a nice backup of the .gnupg directory, and the subkeys loaded to the card we can boot into our normal OS and remove the live USB card. Now everything is set - we explore a few situations where you might want to use a smart card. If someone's sent you a file they'll encrypt it using your public key. You can use the keys stored on your card to decrypt it. 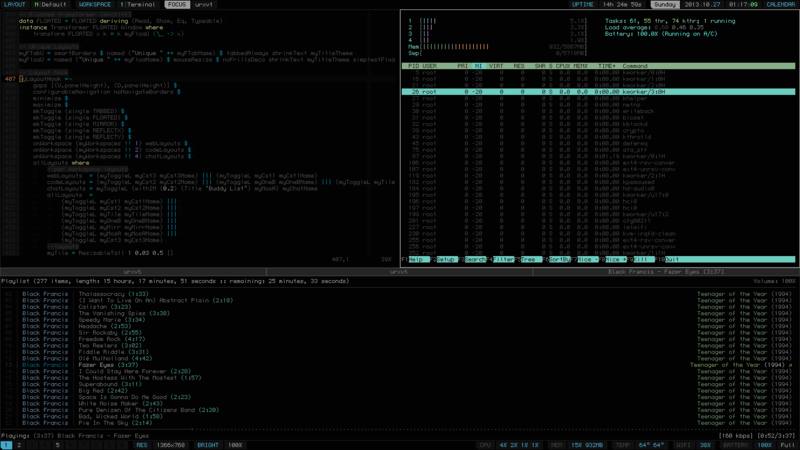 $ sudo emacs /etc/X11/Xsession.options # and comment/remove the line "use-ssh-agent"
Now the world should know not to trust our old keypair, and we can go back to the start of this article and generate a completely new one - this time being extra careful to keep it safe! The XMonad setup I described in this blog post should be functional and extendable enough to get started. 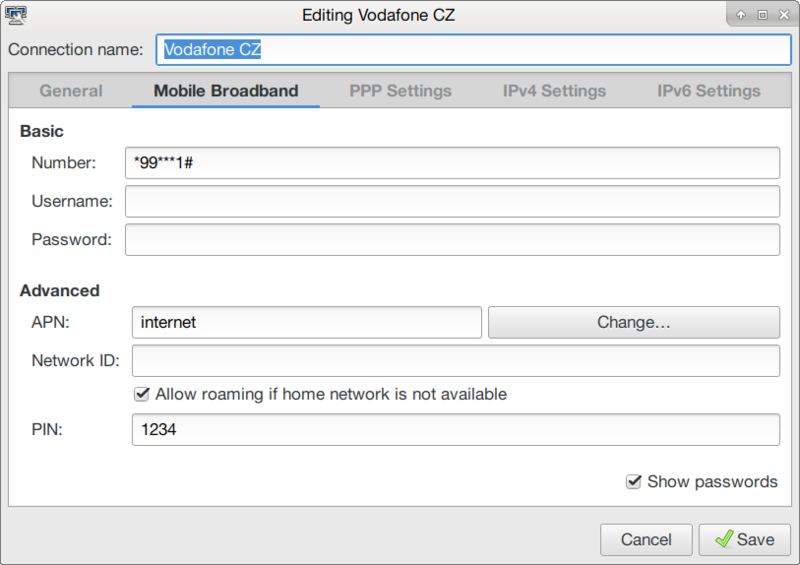 However there is one glaring omission - no easy way to configure any wifi or 3G/4G networks you want to connect to. 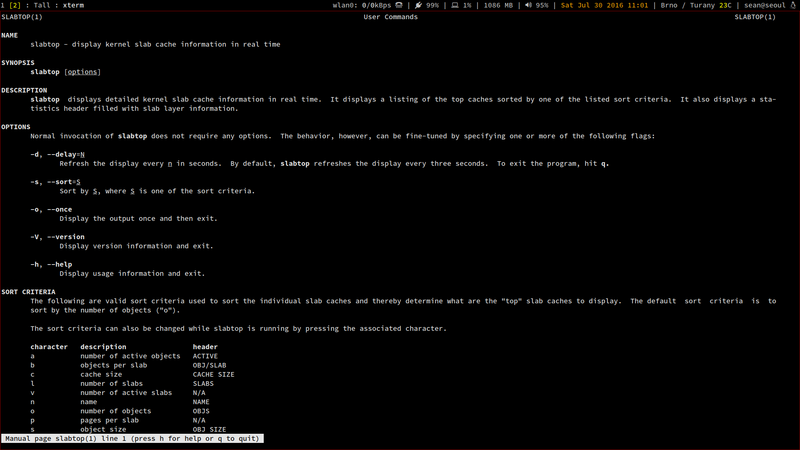 So it's useful to know a little about nmcli, the command-line interface to NetworkManager. This can also be useful if you're futzing around with a linux box remotely. So we've five interfaces, none of which are connected to anything. 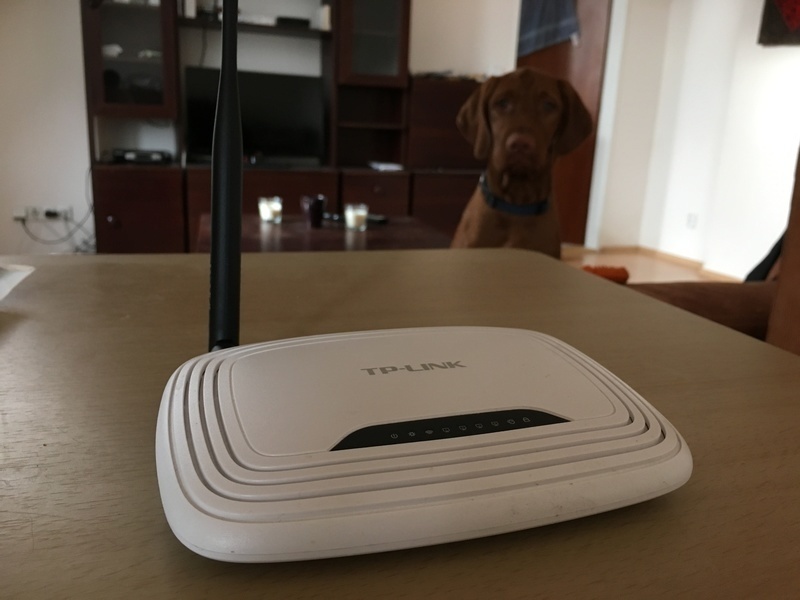 I'll focus on the extremely common use-cases - connecting to open and secured wifi networks using the "wlan0" device, as well as connecting to 3G/4G networks using the "cdc/wdm0" device. $ nmcli device wifi connect "Rotor bar"
Device 'wlan0' successfully activated with 'ccb0a5a1-ef8d-4fea-966f-7999f2611345'. $ nmcli dev wifi con "Rotor bar" password "123456789"
$ nmcli con up id "Rotor bar"
$ nmcli connection up id "Vodafone CZ"
$ nmcli connection down id "Vodafone CZ"
Blog post - "Why you shouldn't hate NetworkManager any more"
It's a little intimidating to be confronted with this, and it's really tough to know how to go from "I have a blank screen" to "check out my shiny desktop". There's no easy way to get to a Settings/Configuration menu to customise things, and clicking around achieves very little indeed. Even firing up a web browser to google for some guides isn't very obvious. 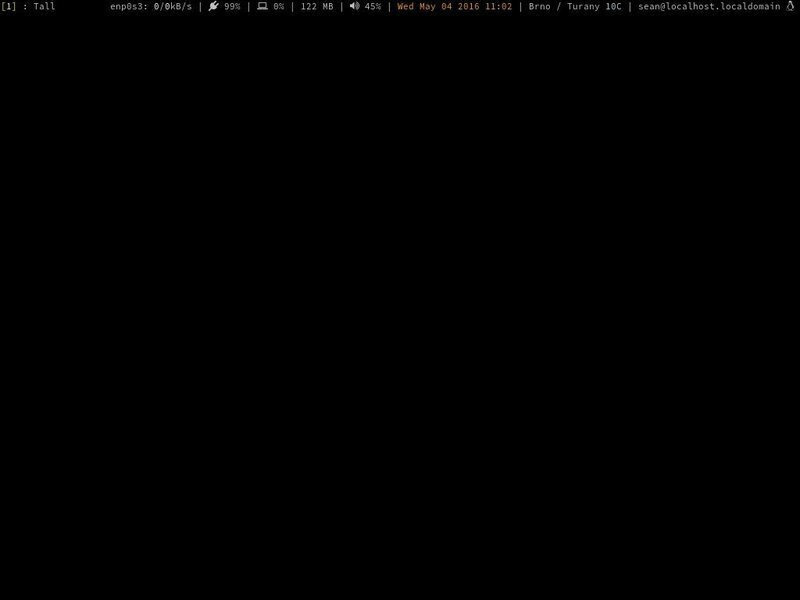 We've got a status bar which shows handy things like workspaces, info about any active network interfaces, the usual cpu/memory usage shenanigans, volume (from a slightly hacky script, more on that later) date and the weather where I am. Also the little Tux emoji in the corner is clickable - by default it saves a screenshot of the whole screen, but you can customise it pretty easily since it's just executing a command in the shell. We can close windows using either some app-specific functionality (Ctrl-Q in firefox, or typing "exit" in xterm), but you can also close the current selected window from XMonad by holding down Windows-Shift-C. 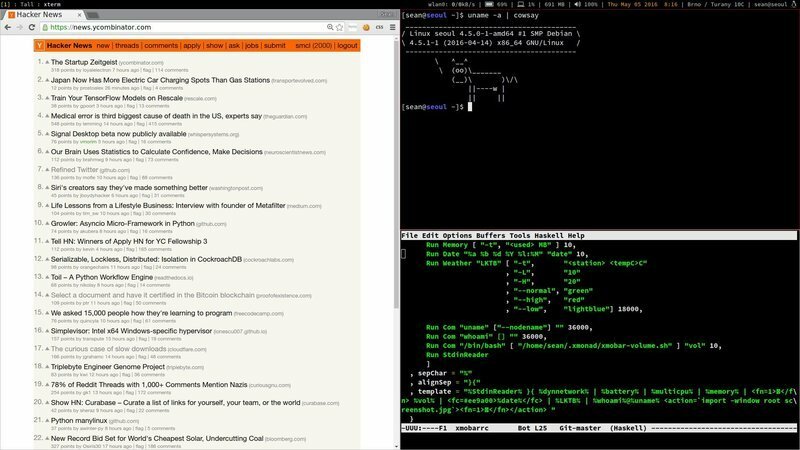 I tend to use workspaces to organise my windows - so I'll have firefox running on its own in one, then a couple of xterms in another, emacs on its own somewhere else etc. To create a new workspace and switch to it press Windows-1, Windows-2 ... Windows-9. 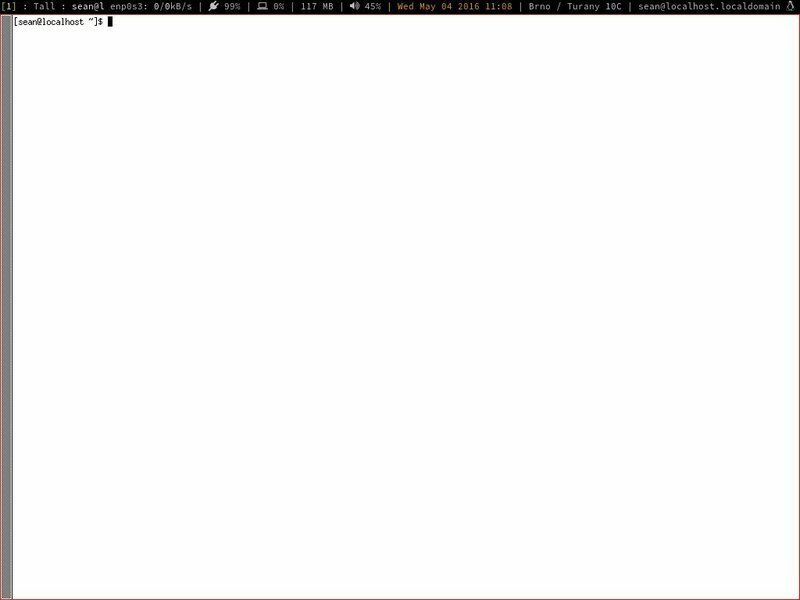 If you're in, say, workspace 1 and you want to move the current window to workspace 2 you can his Windows-Shift-2. 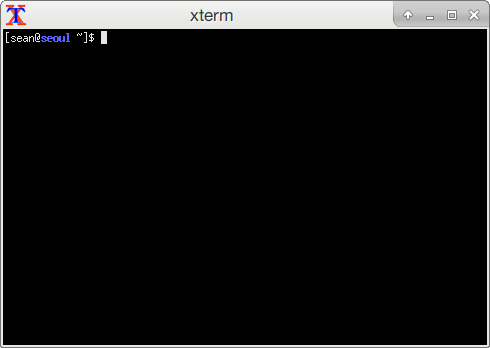 The location used for the weather status is hardcoded in ~/.xmobar/xmobarrc. It's decided by the first arg to "Run Weather" - in my case I've used LKTB, which is the ICAO code for Brno airport. Find your nearest airport's ICAO code using this page and find/replace both instances of LKTB (there should be two) in the file. Now that the irritating part of XMonad is out of the way, you can see what else you can do by checking out the XMonad tour or take a look at the cheat-sheet below and experimenting. I'd also recommend fiddling around with ~/.xmonad/xmobarrc (documentation is here) adding new items to the status bar. 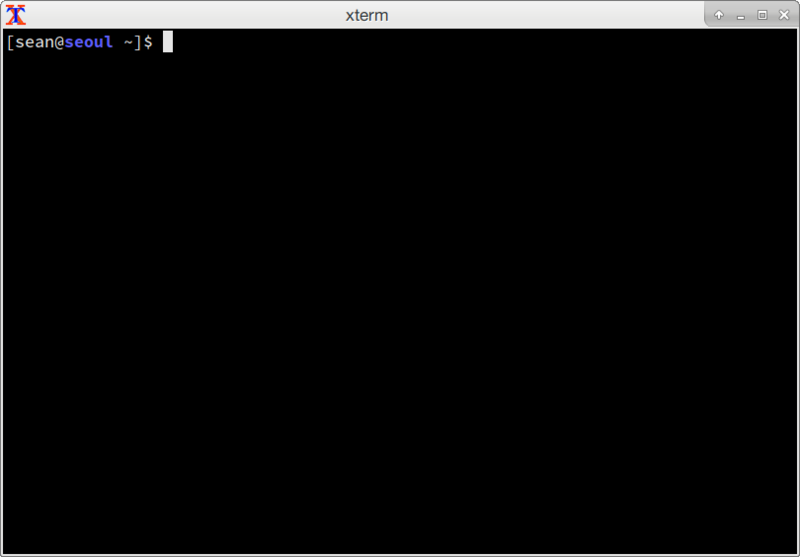 Particularly the "Run Com ..." which let's you run arbitrary commands and will display whatever the output was . The reason it might look a little odd is that it's written in Haskell, so you might want to spent a little time with the excellent Learn You A Haskell to get familiar - but honestly you could get pretty far just copy-pasting existing lines and tinkering with them. Update, 2016-09-08: There's actually an even simpler way to do this if you don't have a remote machine and a domain, you can expose a tor hidden service. The caveat is that you're only able to access it from within the tor network, which means you won't be able to access it from your iPhone. Note: I wrote this a while ago specifically for my BeagleBone Black so some of the instructions refer to "opkg" - the package manager used by Ångström Linux. It looks like they've moved on to use Debian instead of Angstrom nowadays, but realistically you can adapt this guide and use the software on any linux distro on any device. I thought it would be an interesting exercise to use my iPhone as an input device instead of a physical mouse and keyboard. 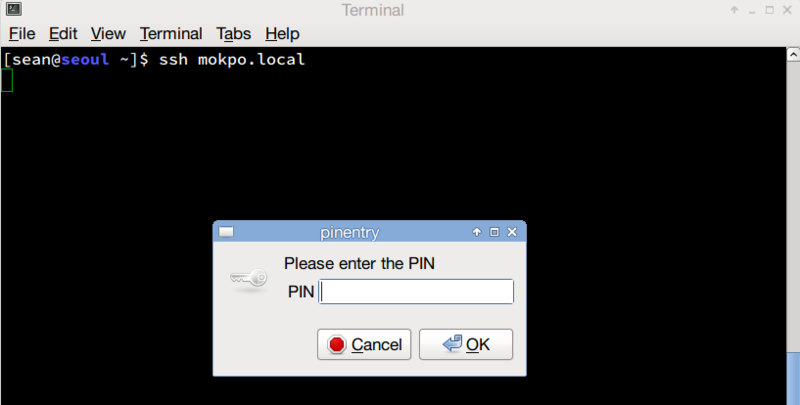 It turns out it's pretty simple, thanks to Tuomas Räsänen's cool python-uinput module together with pybonjour for simple device discovery via Bonjour. First copy the file iBeagle.py file to your beagle. Finally setup pybonjour - bonjour library I used for this. If you're having trouble relating to libdns_sd.so see the section "Appendix - udev trouble" at the end. Currently you need to load the application using Xcode, so you'll need an iOS dev account and an iOS device authorised to your account. Open up iBeagleClient/iBeagleClient.xcodeproj, and build + run on your hardware. 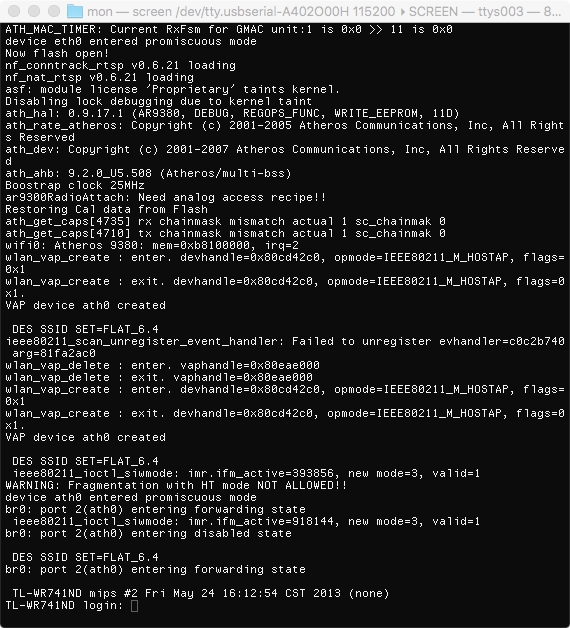 When the server is running you should see your BeagleBone Black listed on the table when you launch the app. If not then try restarting the server, or waiting a few seconds. In my case it was trying to use libdns_sd.so.1 - so I also created a symlink to libdns_sd.so.1. My trusty 2011 Macbook Air started to die recently, and since I'm getting more and more frustrated with OS X (neutering root in El Capitan, for example) I bit the bullet and picked up a Thinkpad X250 on a nice deal and switched to linux full-time. My distro of choice is Debian 8.3 ("Jessie") which is very nice under the hood,but the out-of-the-box UI is a little bit unpolished. Over the last week or so I spent some time bashing it into shape, and since it wasn't so simple I thought I'd share the main steps with anyone else out there. The first thing is that the X250's screen is 1920x1080 but only 12.5 inches and when you first boot up the text appears to be scaled at 96dpi - and it's pretty tiny. Annoyingly the screen is not high-res enough for the standard HiDPI/Retina approach - scaling everything 2x - to work, everything looks a little too big. Getting something halfway is involves fiddling around with a lot of settings, and this is compounded by the fact that various apps and desktops have different ways of handling it. Note that this is mostly for XFCE - some of the other environments look and behave semi-OK (for example Cinnamon is reasonably usable but it eats my battery for breakfast) but I prefer the look and feel of XFCE even if I have to jump through a couple of hoops to get it to play nice. After you reboot X11 will have loaded with the correct DPI setting. Things will still look a little wonky - but we're on the right track so sit tight and keep going. 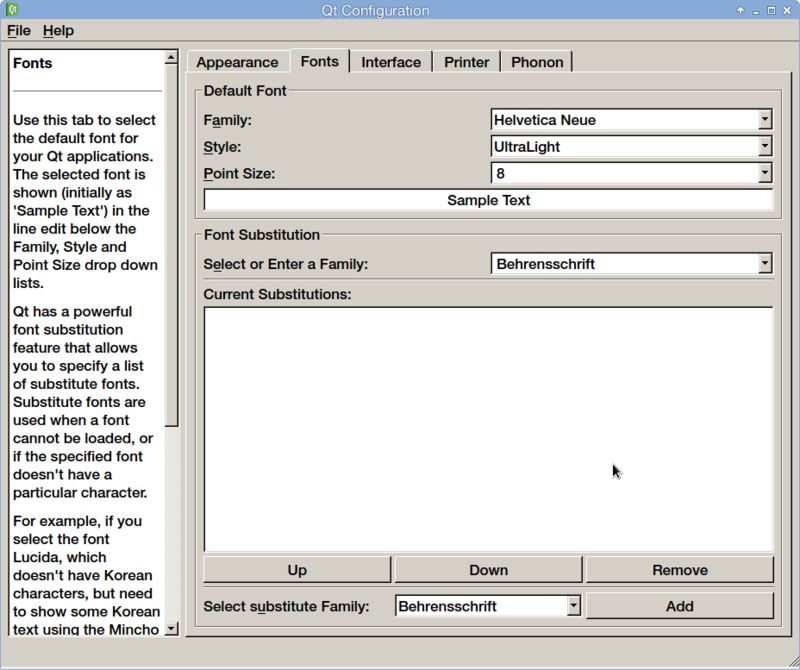 Fixing the XFCE UI element fonts is pretty simple, go to Settings -> Appearance, select the Fonts tab, check the "Custom DPI Setting" box and input 150. 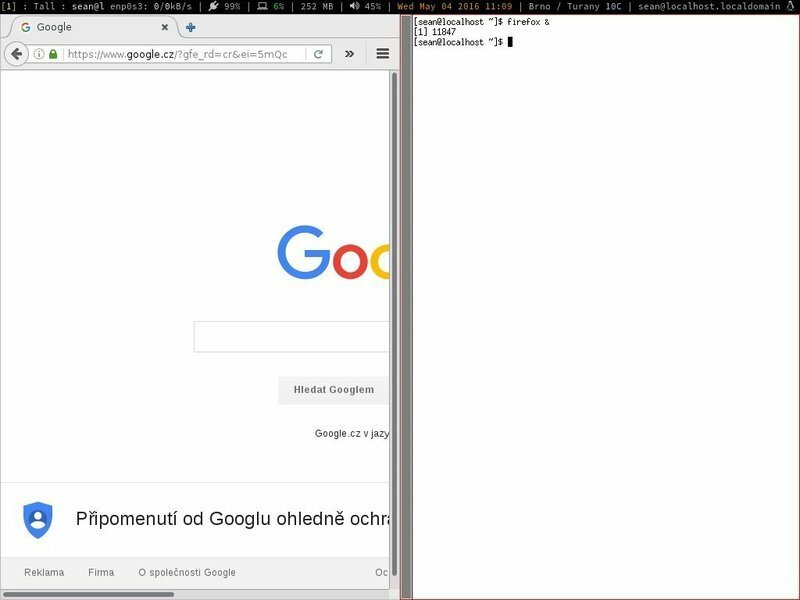 If you use Chromium you can make a similar change to /usr/share/applications/chromium.desktop. 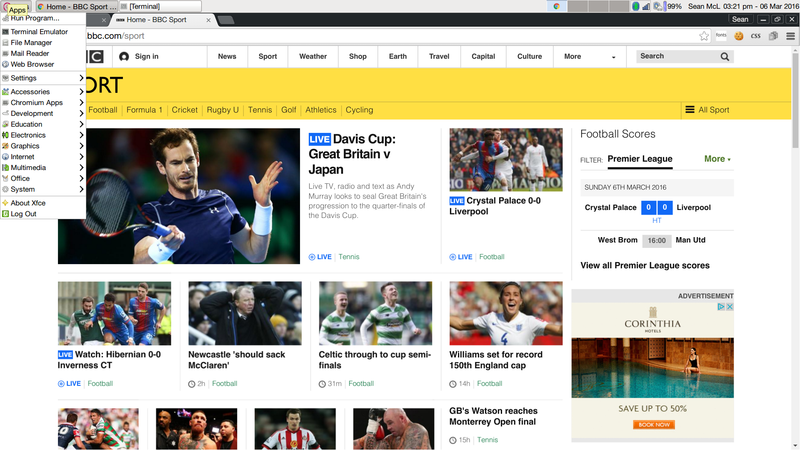 So now Chrome will look a little saner - I also copied over the Times and Helvetica Neue fonts from my Mac and downloaded Source Code Pro to make things look even better. #Option "SecondarySoftButtonAreas" "58% 0 0 15% 42% 58% 0 15%"
The final touchpad tweak is to prevent it from registering touches as clicks while you're typing. XFCE has a setting that looks like it should work, but it leaves an agonising 2 second delay after you type before it enables the touchpad again. There's a handy utility to alter this which is syndaemon. This can also go into .xinitrc. By default the power management settings are a bit of a farce - my battery was exhausted after a handful of hours use even though it's pretty hefty. Strangely it seems that power management is still a bit of a ridiculous scene, I'd last operated a Linux laptop back in 2007 - a Thinkpad T40 - and sadly the out-of-the-box power management is pretty dire. There's a handful of useful applications which can help with individually tweaking things - like powertop - but thankfully there's a useful utility called tlp which appears to improve things significantly with only a little config required. I still find power management a little unreliable - when closing the lid the system doesn't always sleep/suspend, the battery charge is sometimes reported incorrectly (it was stuck at "52%" for a while, which I didn't notice before it died on me). In addition XScreenSaver appears to mess things up too - when I enabled its power management settings it would kill performance after resuming from sleep (with the xorg process consuming >100% of the cpu). Disabling this altogether was fine. Then start the process that's playing the sound - so for me it's Chrome as I was watching Netflix. Open up pavucontrol, switch to the Playback tab find your application and select the bluetooth speaker from the dropdown. This being manual is a little bit frustrating but it's actually a minor step-up from OS X - where sometimes some apps wouldn't output sound to the speaker. After the above tweaks my experience on Debian as a user is roughly on par with OS X (as a developer, it's far better of course). However there are still a number of things I am missing which would make my life a lot better. Trackpad gestures. I was quite fond of multi-touch gestures in OS X to switch workspaces, I haven't got this working in Linux/X.org just yet and I'm not sure if it's available. Hopefully I can pick away at those. 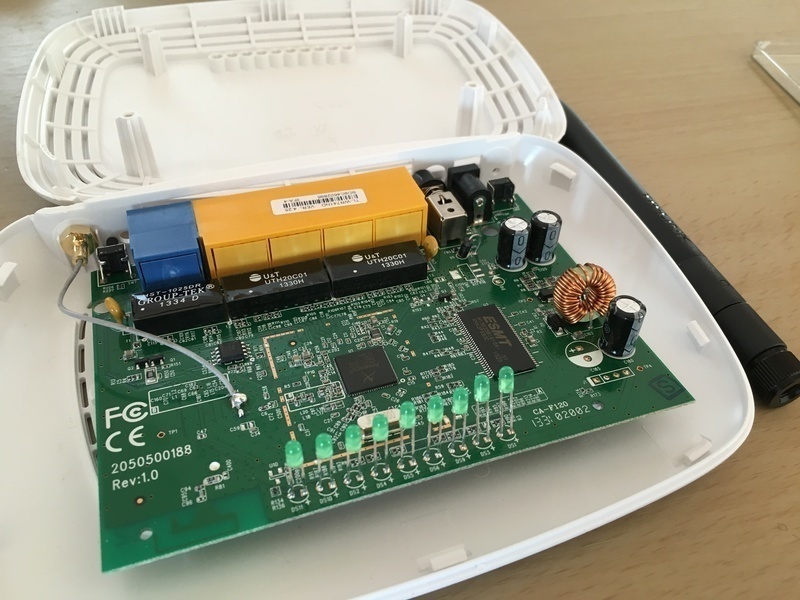 I bought a little GL.iNet router and flashed it with a fresh OpenWRT image but I've been unable to do anything with it yet since it was unable to connect to the net via my apartment's ethernet connection. After some diagnostics I managed to find out that I needed to find the PPPoE username/password my working router used to connect, which was where my weird adventure began. My landlord or previous tenant had (smartly) changed the default password - admin/admin - so I wasn't able to use the web interface or SSH. 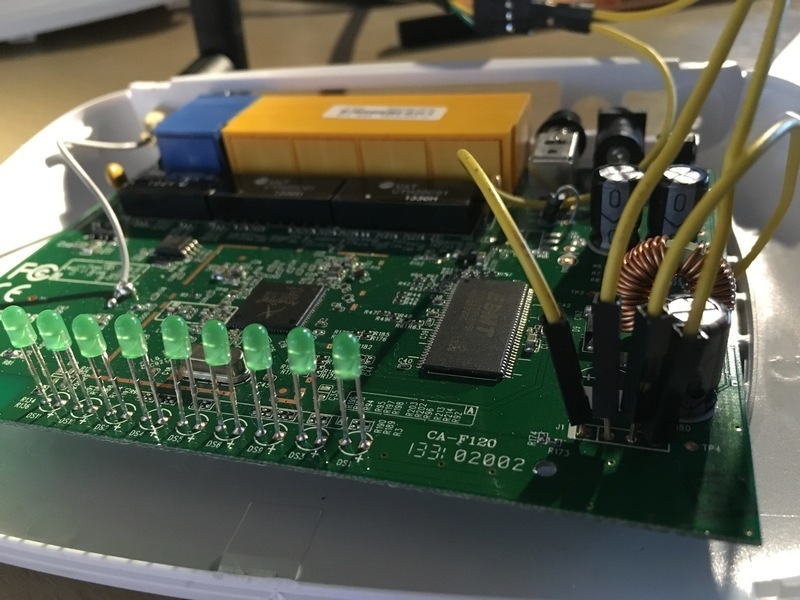 I realised there was likely some Serial headers on the board I could use, so I dug out the schematics, cracked open my router and hoped to god that there was no login required, so that I could retrieve the settings from /etc/chap-secrets where I think they reside. My router is a TP-Link WR741ND v4, a router that sadly doesn't already have serial pins which meant I needed to do a little soldering. ... followed swiftly by a login prompt! I genuinely hoped that serial access would not be password protected, but it seems that I need to regroup and figure out how I can maybe retrieve the pppoe information some other way. 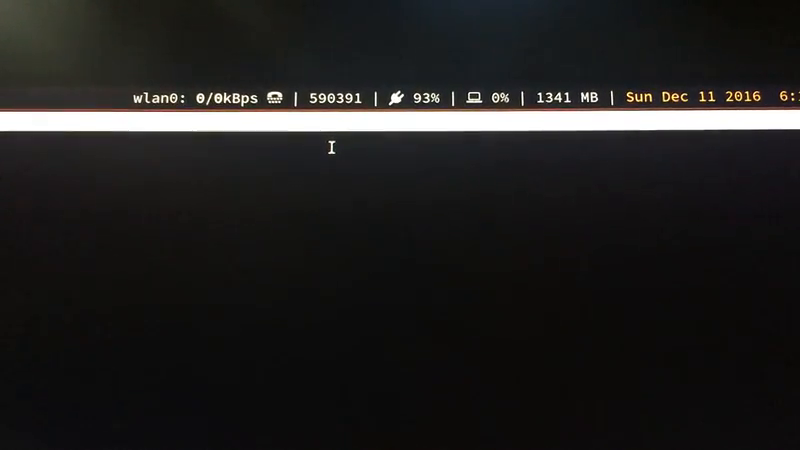 Theres a way I could dump the data in the router's flash memory (I think md/mw/cp uboot commands can help here), find a way to access the filesystem this way. I could get uboot to load a minimal linux image over TFTP (using tftpboot), then mount the flash file system and browse it. The final alternative is to brute force the username (probably still admin) and password, which is a little inelegant and slow.